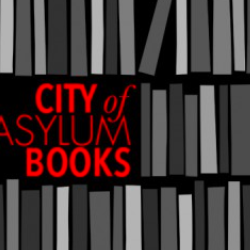 Sampsonia Way interviewed Horacio Castellanos Moya, who shared an excerpt from The Dream of My Return, his latest book, at a Salon Reading at City of Asylum on April 28, 2015. 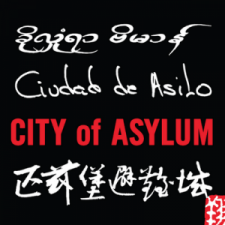 Horacio was an exiled writer-in-residence at City of Asylum from 2006-2009. He now teaches in the Spanish Creative Writing Program at the University of Iowa. 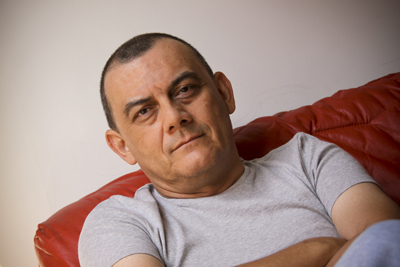 In 2014, his work was honored with the Manuel Rojas Iberoamerican Prize for Fiction, one of the top literary prizes in the Spanish-speaking world. Horacio spoke to us about such a breadth of topics that we decided to publish this interview in two parts. Here, he talks about Roberto Bolaño, legacy, and the writing craft in general. See Part I for insight into the process of writing The Dream of My Return. Why were you interested in writing about an anti-hero for The Dream of My Return? This is something that’s really fashionable right now; the protagonists in Breaking Bad and House of Cards are two examples from American television. Why do you think people want to write about unlikable protagonists? I am not optimistic about human beings. I think that all the bad issues are in everyone and writing about nice people, for me, is boring. You’ve written against the way your contemporary, Roberto Bolaño, was marketed as “rebellious” so that readers would buy his books. How does the tortured Latin American journalist–your protagonist in The Dream of My Return–not buy into this same “Bolaño myth”? First of all, [that article] was a kind of vulgarization. The ideas are not mine. I like them, I share many of them, but they were not mine. They were by academics I thought, “Oh this sounds very interesting, let’s do an article for a newspaper in Argentina.” And I did. Secondly, as I said in that article, the author is not someone that can influence how his work is perceived in markets or places where he doesn’t belong. How I am perceived in France or how I am perceived here is, for me, as distant as how I am perceived in Japan. I don’t get it. Bolaño is so powerful. And he has covered so much that he’s the one that has to get the big share of my generation. Everything that we do will be related to him and that’s unavoidable. As a writer you cannot think about that because it’s not in your hands. It was not [Bolaño’s] purpose anyway. I mean he just wrote his books. The book market deals in every market, region, and country and did what they could do with his books, and it’s the same in my case. I have to be clear: I feel that the Bolaño phenomenon here in the U.S. opened a lot of doors for the translation of young Latin American writers and that was very positive. It doesn’t matter if people perceive the same kind of stuff. Perhaps we share a way of focusing on life because we are the last generation of writers that grew up during the Cold War. We were the last generation that really believed in the socialist revolution and fought for that. We were a generation that saw the collapse of communism and all these utopias. We were a transitional generation. When we were young, revolution and the possibility of having a socialist, political system as a utopia for solving the problems of Latin America was very strong. But when we were becoming young adults that started to collapse. It collapsed when we were adults and we had to re-adapt our way of seeing life, and seeing history, and understanding what was happening. I think that’s the background of all these books. How has your writing process also changed over the years? Has your message and what you want to convey changed with time? My writing process has always been different depending on the book; each book has its own process and its own way of being conceived and produced. I’m a very lazy writer so I think that’s the only constant thing: laziness. Besides that, I guess each book has its own process. For some books–very few books–I did research. Some books are based mainly on my experiences and the experiences of people that I know, like [The Dream of My Return]. Many things are autobiographical from the period I remember even though I don’t like the idea of autobiographical fiction. I like to write for myself and I have to create a character that has features that don’t belong to me and I feel far away from them. Perhaps that’s why I don’t have a lot of personal essays talking from my eye. I prefer the mask. I like to hide. Does any of the work you produced as a young writer embarrass you? What do you think of when you look back on your really early work? My first novel has not been published out of El Salvador but I don’t regret it. There has been two editions in El Salvador and the second one is where I fixed some issues. I see that it’s a first novel, but it’s okay. It’s translated into English but not published. Someone translated it and someone wanted to publish it in French too, but I didn’t want to because my first novel is very critical about the revolution in El Salvador and that was a moment in which the left was going to win the election. I felt the people that wanted to publish it had some extra-literary interest in publishing my book. So I decided not to do it. My first book of short stories, I never published those short stories out of Central America either. I was too young, I was 22 when I published that book. But some people say those are my best writing. I don’t like to think about it because they have too much dialect of the region. Even the Spanish, for someone that is not from Central America, there are too many words that you don’t get because the language is too attached to its own time and that’s very bad for literature. Perhaps the story is good, in the sense of the plot and the characters, but the language was too attached to the language of El Salvador in that moment. Then, of course language evolves and gets old and becomes not understandable. So, that’s the other book that I left out; when I collected my stories [for Indolencia], I didn’t put it. But I have this kind of weird dream that when I finish whatever I have to write I will go back to them and then I will rewrite them in standard Spanish. As a professor at the University of Iowa, what do you think is the most important lesson you can teach your students about writing? You can teach a way of understanding life, a way of reading, a way of seeing the text, the good things in the text, the weaknesses of the text, how a character lacks some features, how description could be lacking, or how the plot is not completely well-developed. They are important, of course, but not the most important. The most important thing is to try to get what your story is because I think that the writer has a story, just what story? You write it many times, in a different way, but there is some deep obsession there. What do you hope will be your legacy as a writer, and is this different than what you think you will be remembered for? I come from a country, first of all, where people don’t read. So I don’t know if there will be any legacy. My books are not read in my country; very few people read my books. El Salvador is a country where people don’t care about literature. I mean it’s a very poor country and completely obsessed with politics. It’s a very, very poor country and books are expensive, and it’s a very illiterate country. So, I don’t have the kind of ambitions that an American, German, or French writer might have, where there’s a strong tradition of belonging to something and you are a little bit concerned about how you are going to be seen when you’re gone. I don’t think I’m going to be seen anyway, so if I write it’s because I cannot avoid it. I cannot avoid it because I some kind of rage, I guess. Every time I have an attack of rage, I write a book. But I’m not optimistic about that, how I’m going to be remembered. I don’t think about it because I know the reality. Perhaps in the Latin American tradition there will be some people that could read my books and who remember my books, but because there is no strong national tradition I think that the most possible thing is that they are going to be forgotten. Does that bother you? The idea of impermanence? Of course. That’s something that makes you think, “What’s the meaning of what I do?” That’s why I said that if I do what I do, it’s because I cannot avoid it.